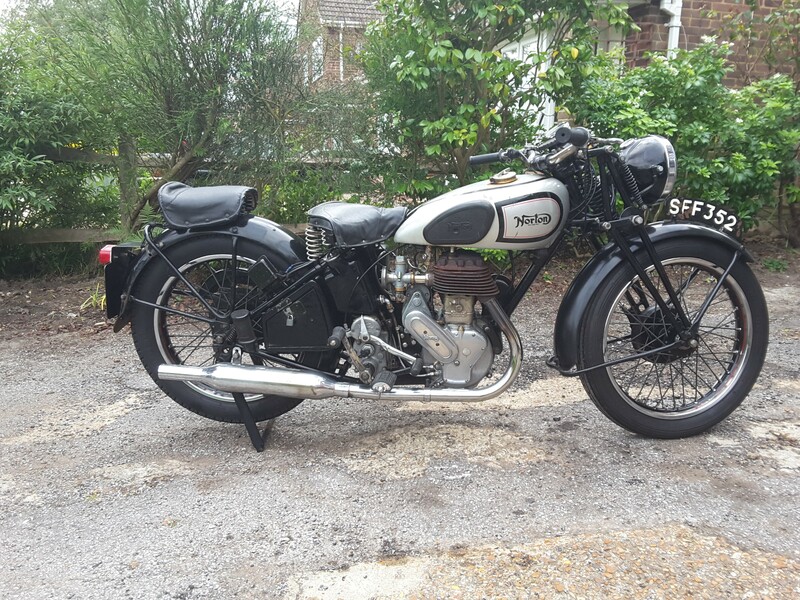 I regularly visit The Motorcycle Workshop in Bolney and Tony Masters attends to my collection of Norton’s, undertaking major repairs and MOTs (yes, I still get them done annually to check sure my bikes are in good order despite my regular servicing). 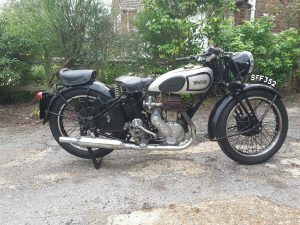 He advised me that he was holding the first ever show at The Gribble in Oving and I agreed to take my un-restored and original 1940 Norton 16H. I’m no expert on 16Hs, but mine is an original civilian model according to Rob Van den Brink when he saw it in September 2009 at the 65th anniversary of Operation Market Garden – another story previously seen in the Surrey section’s Peashooter magazine and a 900 mile, long weekend ride. The Gribble Inn is a charming public house, nestled in the quaint village of Oving. 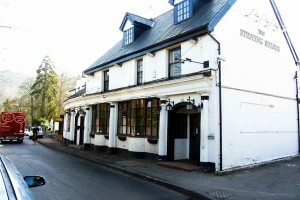 It is situated close to the South Downs with views to Goodwood, three miles from the historical city of Chichester. It is a 16th century thatched cottage that was once the home of local school teacher Rose Gribble. Following her death in 1980, a local farmer bought and transformed the cottage into a public house for the local Oving parishioners. In memory of Rose, it was named ‘The Gribble’ as a lasting tribute to her. The onsite micro-brewery has been active since the opening of the pub in 1980 and it is well worth a visit if you are in the vicinity. The show started at noon, so I thought a slow potter down through the lanes and left Horsham at 10am. It was a pleasant sunny day and despite my best efforts to take my time, I arrived at 11am, the 16H not wishing to dawdle and touching 60mph between Storrington and Amberley without any effort. On arrival I was waved into a prime position outside the brewing room by Tony. In all around 50 bikes and 15 cars attended the show and prizes were awarded for various categories, judging being undertaken by independent people who I didn’t know (I’ll guess at the landlord). Many people came to see the exhibits which varied from Pioneer Run bikes to modern classics such as the MCW cafe racers (check their website) and as usual I allowed children to sit on my machine to experience the feel of a nearly 80 year old bike. I was most surprised to receive a prize for best pre-war motorcycle – I don’t attend shows for prizes, just to let others experience the feel of an old machine and hopefully gain new members to the classic bike scene. The ride back was exhilarating perhaps because I had won a trophy, perhaps because the 16H recognised the honour, but whatever it was, the day was one to remember.